Inside Agra town Agra Fort is another famous historical place to visit after Taj Mahal. At present nearly 75 percent of the area of this fort is under Indian army control. This fort was constructed by Mughal Emperor Akbar in the year 1565 AD and his successors had added many other parts to this fort. 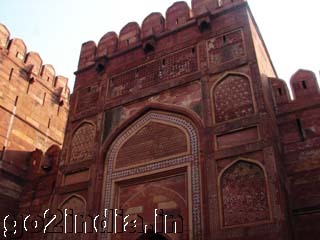 This fort is situated east of Agra city at the bank of Yamuna river. Thick wall of red sand stone covers this fort. There were two ditches surrounding the fort, the inner ditch is still there and the outer ditch is covered and now roads are there it its place. You can see similar ditches at Lal Kill at Delhi also. These ditches were full of dreaded crocodiles to prevent enemies' easy access to the fort. Agra Fort had four gates but now only two of them are in use. One is Delhi Gate and other one is Amar Singh Gate. Amar Singh Gate was constructed by Emperor Shah Jahan after the name of the great Rajput here Amar Singh, maharaja of Jodhpur. After entering to the fort through Amar Singh Gate to the right is the Jahangir's Palace. This palace was built by Akbar for his son Jahangir. Grape Garden was constructed by Akbar the Great for his empress and other ladies of his harem. This garden is sounded by double storied buildings on three sides. There are two beautiful residence for two daughters of Shah Jahan. This hall was for private and dignified audience. Important and confidential discussions were used to held here. 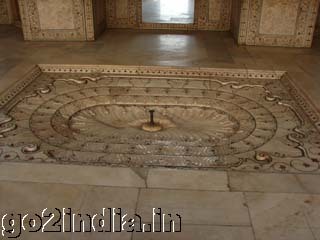 The famous peacock throne of Shah Jahan was placed here. For the ladies of harem this ladies market was opened by Akbar. Only ladies except emperor were allowed to this market which operated once in month. Other important structures includes Moti Masjid, Diwan � e � am, elephant gate, Nageena Masjid. The fort is open from morning to evening. Cameras are allowed and entry fee is Rs 20.